Looking to score a wicked new drum kit on Black Friday weekend? We’ve searched and found the BEST DEALS GOING! Check HERE for the latest deals FIRST! For under $100, this one is without question the winner. 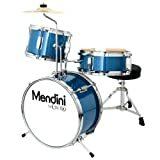 Mendini by Cecilio 13 Inch 3-Piece Kids With the Cecilio, you benefit from Mendini’s well-renowned manufacturing capabilities and quality build, without breaking the bank. Pearl Roadshow, 5-Piece Drumset : For under $500, this one is a no-brainer. Pearl’s famous for their professional looks, great value and quality manufacture. The price varies depending on the setup you choose, check out the current offers here . Alternatively, if price is an issue, try the 4-Piece Roadshow on the right. 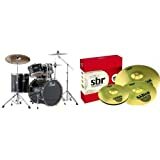 Tama Imperialstar : This kit offers everything the starting player needs at an outstanding price. That includes higher-quality cymbals than most entry-level sets (Meinl) and even a splash cymbal with its holder thrown in for free. Check out the current price here . Pearl Export : Say hello to the best-selling drum set on Amazon. It’s Pearl’s version of something that fits the needs of a serious first-time student, but that could also be used by an early professional. You can purchase it without cymbals for around $630, or with an optional pack of 3 Sabian cymbals for around $820. Current price here . Ludwig Breakbeats : If you need something smaller, that will perhaps fulfill travel purposes (when going off to college maybe? ), this kit from Ludwig is conveniently small but sounds and plays almost like a full-sized. Current offers here . Every drum set in this list was chosen because they offer the greatest price/quality relation. They also fulfill most of the needs you would expect: They’re not expensive but are durable enough to sustain practice sessions, band rehearsals, and even a little gigging and touring. 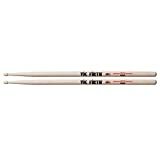 Pearl is a world-renowned brand of drums that numerous professionals and teachers use and recommend. The roadshow is simply their most basic kit, meant specifically for beginners. made with the same design-thinking of some of the best drums being made today. Something cool about the Roadshow is that you can choose between several styles of drums (and colors, of course). The cymbals it comes with are made by Pearl as well, which is why the Roadshow is priced so lightly. Pearl is not a manufacturer known for its cymbals and their professional-level kits are usually sold without them. That being said, the included cymbals (a crash and hi-hats) work perfectly fine for starters. Everything we’ve said about Pearl drums could also be said about Tama. Both are among the biggest names when it comes to drums. So the Imperial Star is another great choice that features a few perks to make up for the price increase. 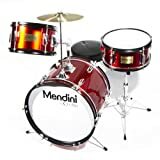 Namely, these are that it’s sold exclusively as a 5-piece drum set (3 toms, snare and bass drum) and that the cymbals are not made by Tama but by another well-known manufacturer, Meinl. This one’s simply a step-up the ladder when it comes to entry-level drums from Pearl. Its upgrades from the Roadshow are basically in the wood, drum heads (the export comes with Remo heads) and the wrap. The Roadshow is made of White Poplar, while the Export combines Poplar and Mahogany, the latter being more widely used for musical instruments in general. The Pearl Export also features an upgraded covered wrap in regards to the Roadshow. The wrap being the colored part of the drum set which encloses each drum. 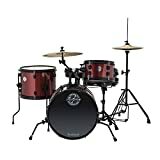 Depending on the stage for each particular high-schooler, moving, having little space or the need for easy transportation may be a common constraint when considering which drum kit to purchase. Which is why we included the Ludwig Breakbeats. There are many travel-sized kits out there, but this is probably the greatest deal due to its price and the dimension of the drums. When buying a travel kit, the main problem to consider is the low end. Smaller drums translate to higher-pitched sounds, which may fall flat when performing, or just make for less punchy practice sessions. One last thing to note on the Breakbeats, is that it’s only a “shell pack”, meaning that only the drums are included. It comes with no stands and no cymbals. It does come with its own bags for easy packing and carrying though, which is nice. 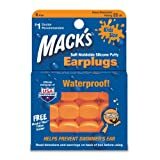 To close this off, here’s a list of the essential starter accessories a high-schooler might need when beginning to drum. Drums can be LOUD! So make sure you protect your ears somehow. This is NOT NEGOTIABLE! Hearing cannot be repaired. 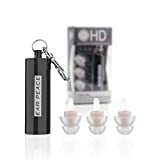 EarPeace HD ear plugs are a great choice for musicians. Otherwise, regular ol’ earplugs may suffice. Mack’s are generally regarded as the best. 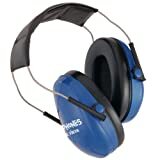 Or, there are also some great isolation headphones. And on a final note, if loudness is a major constraint, you can always check out our selection of the best electronic drum sets.